The Flex House, the latest of Green Builder Media’s esteemed VISION House demonstration project series, is a small-footprint, net zero, solar powered, smart sustainable home designed to help homeowners use exactly the amount of resources they need to live affordably and abundantly without unduly taxing the resources of our beautiful planet. 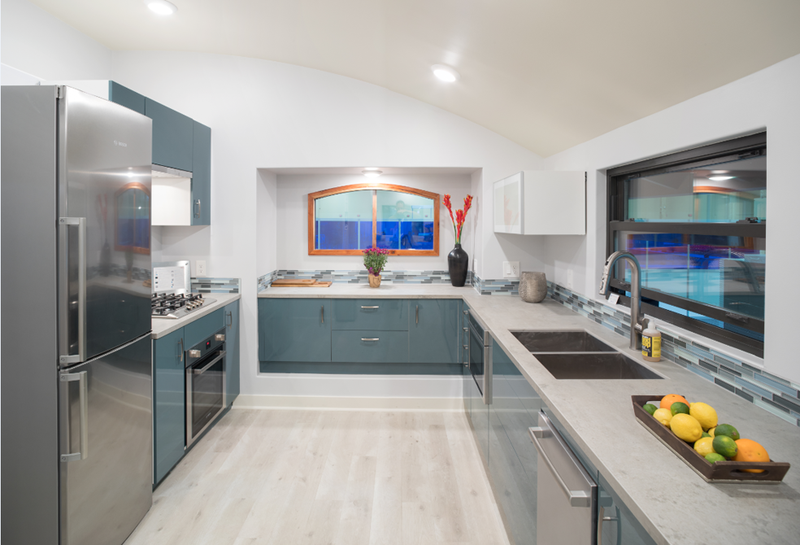 Weighing in at only 760 square feet, the Flex House makes a big impression with its high ceilings, arched doorways, rounded corners, clerestory windows, and U-shaped flow. The home is net-zero and designed to be its own microgrid, producing all its own power with high performance solar panels and battery storage. The Flex House conserves water and is resilient, healthy, and durable, and it boasts a full ecosystem of smart home devices that streamline resource use and keep homeowners safe and protected. Perhaps the best part about the Flex House is its price tag—rolling off the production floor at $125,000, the turnkey house offers a beautiful, high-quality and affordable option to buyers. While this model is a prototype, the builder is in the process of ramping up manufacturing and we expect to be taking orders soon! Download the Flex House Ebook to learn more about this unique home! Fill out the form on this page for access. Your information will be shared with FlexHouse sponsors.